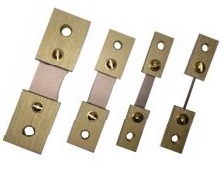 Many transducers use strain gage sensors to convert pressure or force to an electrical output. In these designs, gages are connected as a Wheatstone bridge resulting in an accurate and rugged transducer that can operate in extreme environments. To achieve accuracy, the bridge is adjusted for manufacturing tolerances and temperature effects. "Compensation" resistors are added to correct for bridge unbalance, and to adjust output sensitivity. Other compensation resistors correct for the errors that result when the transducer is used over a wide changing temperature range. Wire wound resistors are ideal for compensating strain gage transducers: They offer the necessary accuracy, and perform reliably at high temperatures. They are designed so that resistance value does not change, or changes in a controlled manner, over different temperature. Riedon has supplied compensation resistors to many customers and recognizes that transducers are highly specialized products normally requiring design-specific compensation resistors. We welcome the opportunity to serve your unique requirements.